Technological innovations have driven economic development and improvement in living conditions throughout history. However, the majority of smallholder farmers in sub‐Saharan Africa have seldom adopted or used science‐based technological innovations. Consequently, several scholars have been persistently questioning the effectiveness of intervention models in smallholder agriculture. Following the agricultural innovation systems framework (AIS), this paper reviews a participatory framework known as the ‘Follow the Innovation’ (FTI) approach, which was developed in the research project ‘Economic and Ecological Restructuring of Land and Water Use in Khorezm’ (2001 ‐ 2012) and employed in an ongoing BiomassWeb project ‘Improving food security in Africa through increased system productivity of biomass‐based value webs’ (2013 ‐ 2018). The FTI approach claims that multi‐stakeholder interactions and the adaptation of ‘innovation packages’ or ‘plausible promises’ are crucial for innovation development. 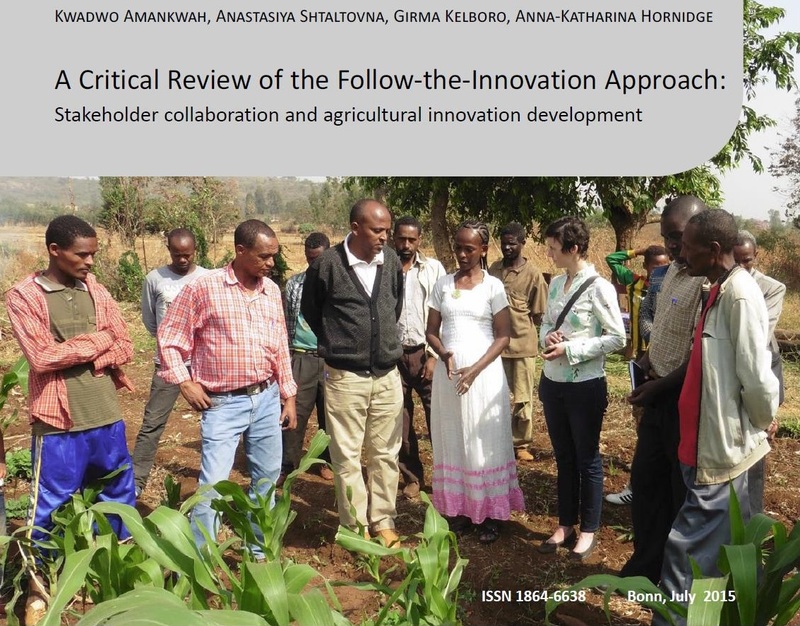 While appreciating the crucial role such packages play in agricultural development, the review at hand calls for a shift from defining agricultural innovation as a package or new technology to the consensus that it is an outcome of the collaborative or collegiate participation of multi‐stakeholders in planning and implementation processes, by generating and combining scientific and local perspectives on technical and non‐technical changes over time and in space, and the reconfiguration or adaptation of embedded informal and formal institutions. This broader definition requires scientists, extensionists, local communities and other stakeholders to perform these key tasks jointly by: 1) constituting a collaborative transdisciplinary and stakeholder dialogue group (or innovation platform) for innovation development, 2) undertaking a broad system diagnosis, to understand opportunities and challenges as well as stakeholders’ claims or points of view and their underlying reasons, 3) identifying shared purposes and forging the accommodation of points of view through dialogue and deliberations among relevant stakeholders, 4) developing joint technical and non‐technical solutions, by creating and maintaining linkages or networks to address problems identified and prioritised through stakeholder interaction processes, and 5) guiding the participatory monitoring and evaluation of stakeholders’ practices and processes in relation to responsiveness. The processes of innovation development and practical applications are intertwined with recognising the contextual nature of these processes, and adaptive approaches are therefore integral parts thereof. Salient implications of this review are highlighted for transdisciplinary research (such as in the BiomassWeb project) aiming at agricultural innovation development in complex environments.